Theatre Square, the Mariinsky Theatre and the Conservatory in St Petersburg are famous, not only in the Russian Federation, but throughout the world. The square itself appeared a mere 30 years after the founding of the great northern capital in the 1730s and was known as the Brumberg from the name of an entrepreneur who owned local sawmills. During the reign of Catherine 2nd on Palace Square, in 1766, festivities took place. Amphitheatres were built for equestrian games for the nobility, but after these were over, it was decided to move any future festivities to the Kolumna area adjacent to the Kryukov Canal - Roundabout Square. Here the locals could enjoy swings, roundabouts, comedians, and enjoy a stroll around this part of the city. In 1773, Catherine decreed that a theatre be built. It took from 1775 to 1783 and was designed by Antonio Rinaldi, an Italian architect. This became known as the Stone Theatre and was at this time, the largest theatre in Europe and the square was named Kamenny (Stone) Square. At the beginning of the XIX century it was rebuilt by an architect called J Tom de Tomon and became Tealtralnaya, Theatre Square. In 1811, a fire almost destroyed the Bolshoi Theatre. To quote Alexander Naryshkin (nobleman and theatre director) “There is nothing more; no lies, no district, no scenes - all one parterre” (everything was destroyed ). It was reconstructed from the designs of V.V.Nicholas. The inspiration and foundation for this long established, musical institution belongs to Anton Rubinstein (1829-1894) one of the most charismatic characters in the history of Russian music. During the reign of Nicholas 1, a wooden circus theatre was built ; designed by A.K. Kavos, a Russian/Italian architect. Unfortunately after 10 years in 1859, this was also destroyed by fire. Under Kavos’ guidance it was reconstructed and became the famous Mariinsky Theatre, named after Empress Maria Alexandrovna the wife of Alexander II. Both the Royal box and the box for the Minister of the Imperial Court had separate lobbies, foyers and stairs. The architecture and decoration of this newly constructed theatre were impressive. It opened on October 2nd 1860 with the premiere of M Glinka’s “A Life for The Tsar”. 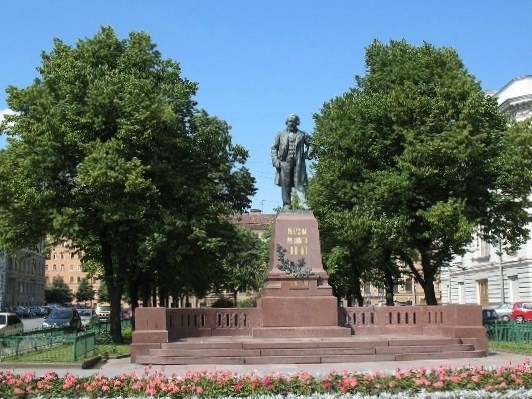 In 1906, a monument was erected to Mikhail Glinka but this was later moved as unfortunately it impeded the view towards St Nicholas Cathedral and also interfered with the traffic. He can still be admired in his position to the right of the Conservatory. (Sculptor: R.R.Bach, architect: A.R.Bach). 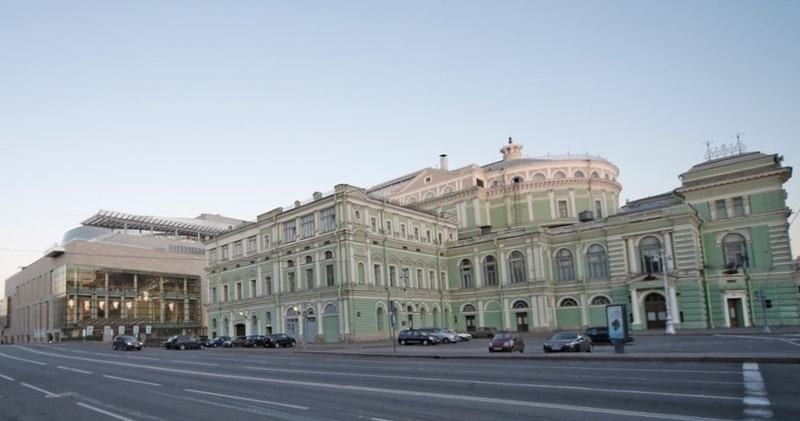 The facade of the Mariinsky, in the main, has not changed much, from the time when it was conceived and designed by V.A.Shreter. Neither has the interior, which sports a magnificent Royal Box, a luxurious curtain, and a crystal chandelier; the overall colours being blue and gold. The interior architecture is rich; twisted columns, torn pediments and stucco decorations of female heads and masks. The visitor is mesmerised by figures of the Atlanteans and Caryatids which decorate the boxes. Particularly striking to those visitors whose gaze travels upwards is the ceiling decoration of dancing girls and cupids which were painted by E Franciolli from the sketches of H Douzi. These are surrounded by portraits of Russian playwrights. The Mariinsky Theatre in present day. The repertoire of today’s theatre includes works from the gold fund of opera and ballet classics but new and innovative works are also being sought. In more recent times, the Mariinsky has partnered some of the world’s largest and most famous theatres. These have included Covent Garden, opera de Bastille, La Scala, and La Fenice. Under the leadership of Valery Gergiev, it has become the best musical theatre in Russia. Both the opera and ballet troupes are the strongest amongst domestic and foreign collectives. The theatre employs talented artists, many of whom have become world’s stars - O. Borodin, A. Netrebko, U. Lopatkin, and D. Vishnev. Obtaining a ticket for the Mariinsky is not easy, although they can be bought in advance and on-line. Prices can range between 400 to 2500 rubles and for one -off performances you can pay as much as 6000 rubles. Whatever you pay, you will be part of the most beautiful tradition of Russian theatre. Whatever you see, you will not forget the experience of sitting in this most historic of buildings in this most beguiling city. The Mariinsky second stage, a more recent edition (2013) is located behind the original building on the other bank of the Kryukov Canal. The Mariinsky Theatre Concert Hall is located a five minute walk from Theatre Square at Ulitsa Pisarev.